The Crohn’s disease is the one of the most common disease of digestive system in western world. The symptoms can be very different but the most usual are bad appetite, and with that weight loss, bad absorption of some very important elements such as minerals and vitamins. The treatment of Crohn’s disease is considered certain diet and full-time visit gastroenterologist and nutritionist. One of the most important for goodness of organism is proper nutrition. The proper nutrition is important for everybody, especially for people that suffered Crohn’s disease. For people with Crohn’s is very important to take enough calories, vitamins, minerals and proteins. The special diets can allow enough of the elements that are very important for health. There are four nutritive groups: meat or other source of protein, dairy products, grains and cereals, fruit and vegetables. 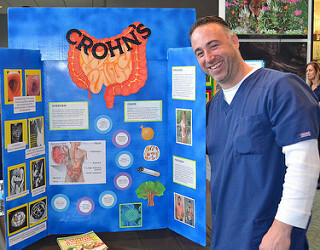 The diet for people with Crohn’s disease must be made by organism of diseased. On the other hand, the body will start to reject the elements, both good and bad. That is why people with Crohn’s must be very careful what are they eating and how big their meals are. It is also very important to take maybe extra vitamins or minerals if it is not enough. But this is the thing that gastroenterologist and nutritionist must advise diseased. It is usual that doctors prescript bigger doze of Vitamin B-12, Vitamin D and folic acid. When it comes to the minerals, most common recommended minerals are calcium and iron. Of course, this is only present of most common prescriptions. It is not the same at all patients. It is very important to mention that first you must consult your doctor if you want to use something from this list as natural source of vitamins and minerals. As a person with Crohn’s disease you could be intolerant on some of the element from the list. Vitamin A can be found in liver, eggs, fish oil, dairy products, green peas, spinach. Vitamin D can be found also in liver, fish oil, but in milk, butter and cereals. Vitamin C can be found in oranges, lemon, tangerine, bananas, apples. Folic acid can be found in liver, beet, corn, beans, peas, lens, cabbage, lettuce. Vitamin B12 can be found in chicken, turkey, fish. Calcium can be found in milk, yogurt, ice cream, cheese, sardines. Iron can be found in fish, red meat, chicken, turkey, eggs. Zinc can be found in beef, chicken, beans, green peas, bran. For people that suffer Crohn’s disease is very important to have enough liquids in organism, and to try not to lose the liquids all the time. It is also very recommendable to avoid alcohol and caffeine because of the dehydrating fact of these two elements. Why are meat and dairy necessary in one's nutrition?